Rodeo Clown In Obama Mask Sparks Outrage, Apologies : The Two-Way At the Missouri State Fair, a crowd was worked up by the sight of "Obama" being chased by a raging bull. It felt "like some kind of Klan rally," a spectator says. 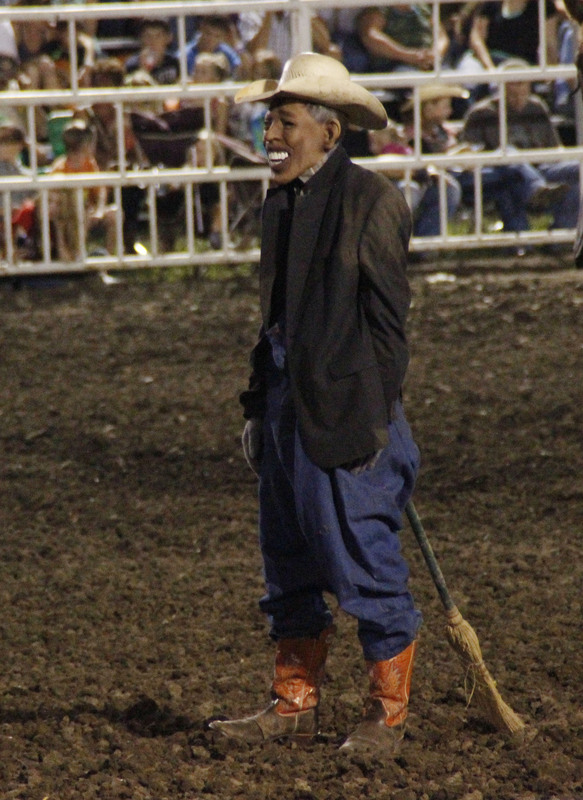 A photo taken of the clown who wore a mask resembling President Obama during a rodeo at the Missouri State Fair on Saturday. "It was feeling like some kind of Klan rally." That's the reaction of spectator Perry Beam to Saturday's appearance at the Missouri State Fair in Sedalia, Mo., of a rodeo clown wearing a mask meant to look like President Obama and what happened during his performance. Videos that Beam took show some of the scene and capture some of what the rodeo announcer and another clown were saying. The Kansas City Star has posted two of the clips on its YouTube channel. In one, the announcer says, "Obama's gonna have to just stay there ... Obama watch out for those bulls." Another voice can then be heard saying "I know I'm a clown, he just run [sic] around acting like one [and] doesn't know he is one." In the other clip, a clown can be heard saying, "We're gonna smoke Obama ... Obama they're coming for you this time. Don't you move, he's gonna getcha, getcha, getcha, getcha!" "The announcer wanted to know if anyone would like to see Obama run down by a bull. The crowd went wild. He asked it again and again, louder each time, whipping the audience into a lather." Condemnations and apologies have followed. "The performance by one of the rodeo clowns at Saturday's event was inappropriate and disrespectful, and does not reflect the opinions or standards of the Missouri State Fair. We strive to be a family friendly event and regret that Saturday's rodeo badly missed that mark." Republican Lt. Gov. Peter Kinder was among the first state leaders to weigh in, writing on Twitter that "the @MoStateFair celebrates Missouri and our people. I condemn the actions disrespectful to POTUS the other night. We are better than this." Democratic Sen. Claire McCaskill issued a statement saying that the fair "is funded by taxpayer dollars, and is supposed to be a place where we can all bring out families and celebrate the state that we love." Beam, the spectator, tells The Associated Press that the rodeo act "was cruel. It was disturbing. I'm still sick to my stomach over it ... I've never seen anything so blatantly racist in my life ... If an old country boy picks up on something like that, imagine what a person of color would think." A previous version of this post incorrectly placed the Missouri State Fair in Kansas City instead of Sedalia, Mo.